Ladies and gentlemen…I present to you a national legend…The Great Rabbino. You heard me correctly. The Great Rabbino, aka TGR. A clever name, I might add. The brains behind this wonderful site is a dear friend, and uber sports aficionado. Two years ago today (!) TGR was born. It was the “love child” if you will, of my friend and his then fiance (now wife). You see, while she was busy planning their wedding, he had to find a way to channel all his excitement for their big day, and decided to start writing about the next best thing to his upcoming marriage…the marriage between sports and Judaism! Fast forward two years, and The Great Rabbino is off the hook! TGR has been featured in the Chicago Tribune, San Francisco Sentinel, and several Jewish print/online publications. Basically, this “love child” has grown big and strong. Yasher Koach! As The Great Bambino says in The Sandlot, “Everybody gets one chance to do something great. Most people never take the chance, either because they’re too scared, or they don’t recognize it when it spits on their shoes.” This blog is my friend’s chance to do something great. And he sure is! When I created the Chicago Bulls flavor a few weeks ago The Great Rabbino gobbled it up, and the next thing I knew, it was featured on their site and on The JewishJournal.Com. 365scoops was flattered, but it was only the beginning! TGR recently approached me again to make a two year anniversary flavor. Ohy, I was plotzing with excitement! I would have to be mashuguna to pass up this opportunity, hell, this could be my one chance to do something great! My mind started racing. 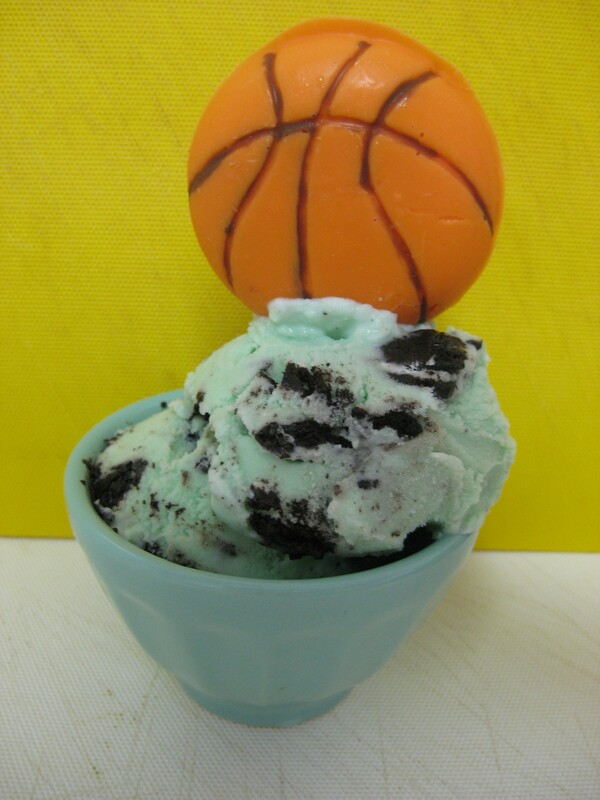 How can I best create an ice cream flavor that embodies sports, Judaism, and deliciousness? I had far too many sleepless nights brainstorming flavors until finally The Great Bambino came to me in a dream saying “If you churn it, they will come.” And the rest, my friends, is history! I owe you a bit of background on this flavor. During one of my 3am brainstorming sessions (yes, I am exaggerating… slightly) I thought, “how can I make a sports ice cream?” ah, hah! 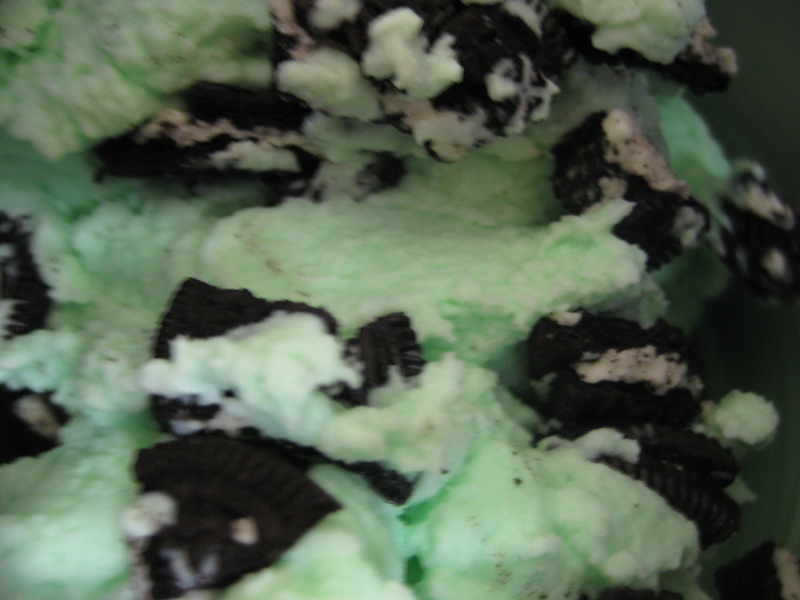 I’ll make green mint Oreo (green for astro turf and Oreos for mud). And then I thought, and “how can I make a Jewish ice cream?” ah, hah! I’ll adapt a recipe from none other than Jerry Greenfield and Ben Cohen (two veritable Jews, aka Ben & Jerry). And to honor this incredible two year anniversary of TGR, I will top each ice cream with a hand-made, chocolate basketball or football. Done and Done. 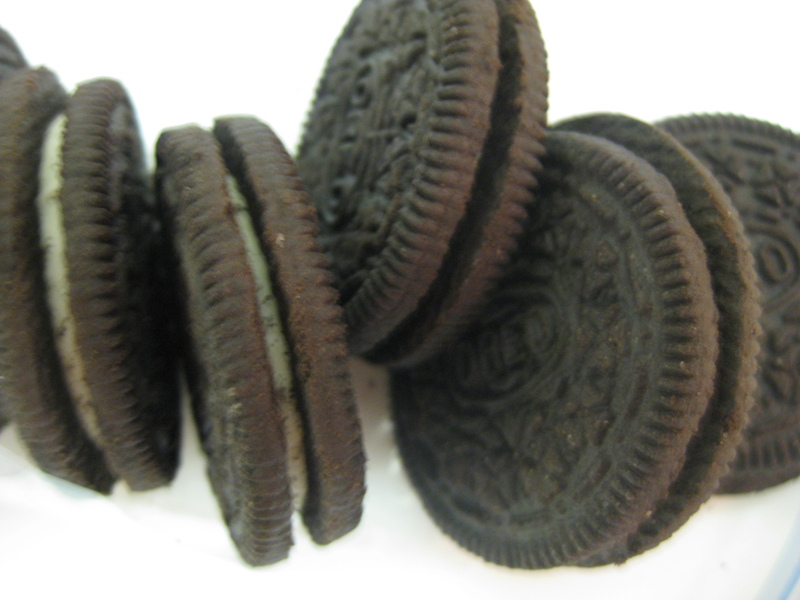 Chop the eight Oreos and store in the refrigerator. Furiously mixing in the green food coloring. Ohy. 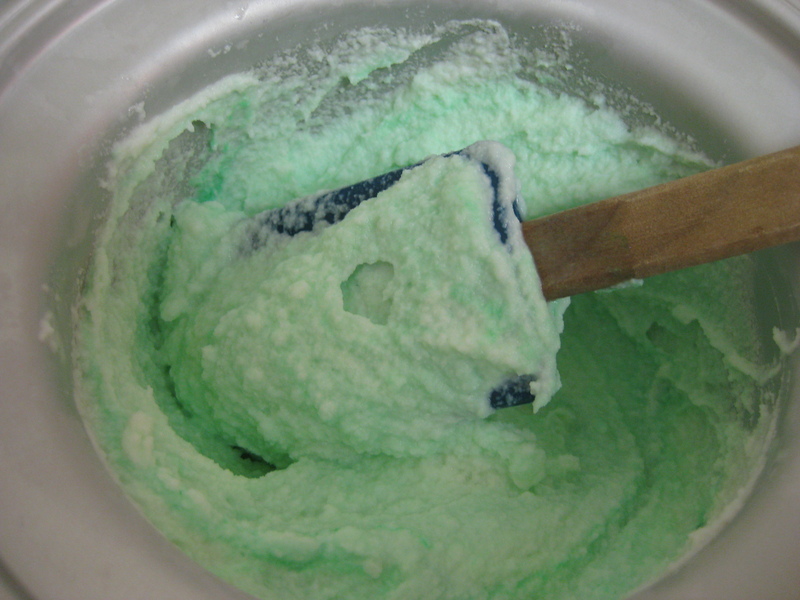 Do NOT forget to add the food coloring or else you will end up like me, adding it while the ice cream is churning, furiously stirring so that it doesn’t clump. Talk about a buzzer beater! Once mixed, pour into the bowl of an ice cream maker and churn according to the manufacturer’s instructions. Approximately 2 minutes before the ice cream is done churning slowly add in the Oreos. Store in a freezer safe container and let harden in the freezer for approximately 2 hours before serving. Created by me, designed by Wilton! Why does it look like I was doing arts and crafts? Oh wait, because I was "painting" with chocolate, that's why! Ohy. This was tedious. Deep breaths. Melt the chocolate disks in the microwave for 30 seconds, stir and then repeat until the candy is melted. Be careful not to over-melt it. First, “paint” different colors in your candies (i.e. the brown lines on the basketball and the white lines on the football). 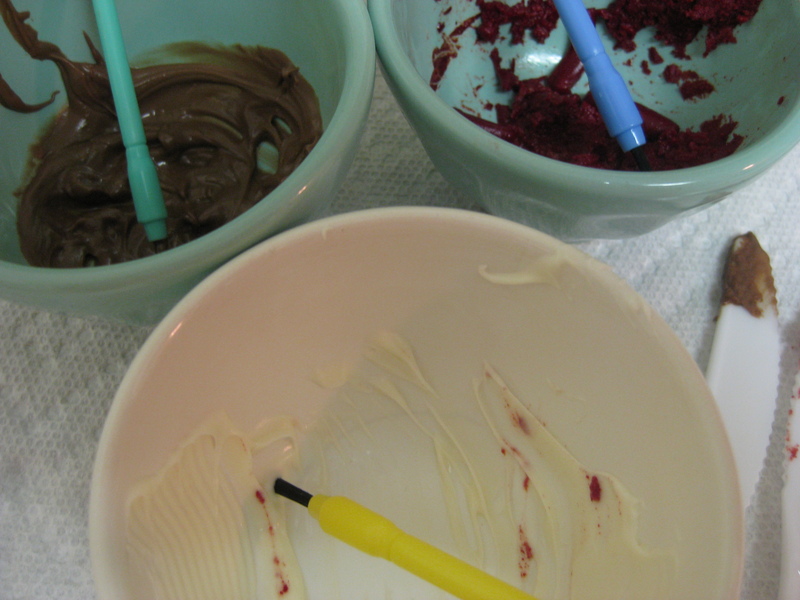 To do so, dip a decorator’s brush in the melted chocolate and “paint” within the small grooves on the candy mold. The first few you paint may not be amazing. Don’t worry about it. Paint the features or details as desired and let the candy sit and cool completely (I put mine in the refrigerator). Voila! 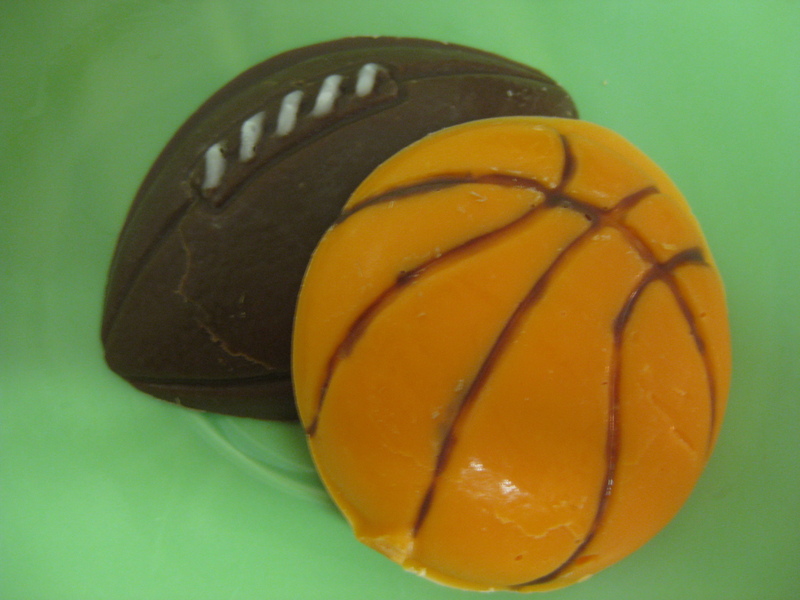 Hand-made chocolate football and basketball. 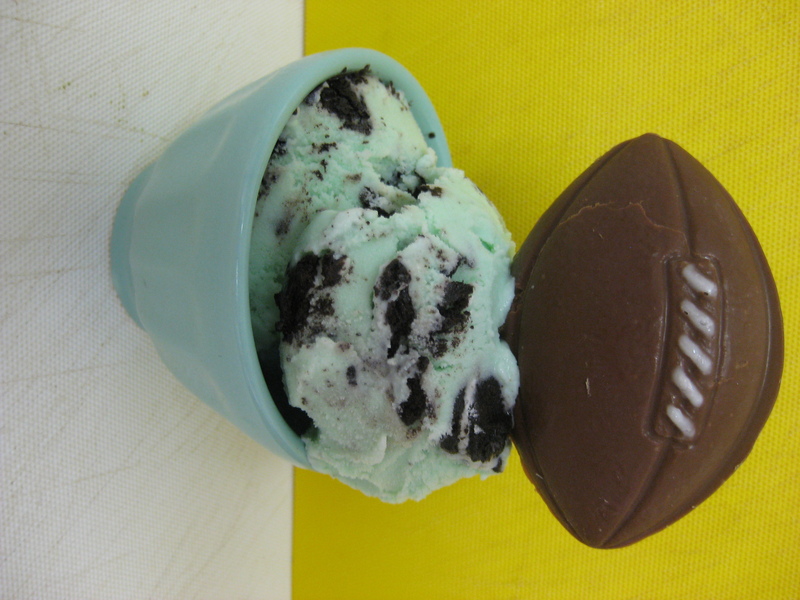 The Great Assembly: To assemble the Great Rabbino Ice Cream treat simply serve two heaping scoops of The Great Rabbino Ice Cream and top it with either a football or basketball. Voila! Devour and enjoy! The Verdict: In the words of Rachel Ray YUM-O! I’m not just saying this because this mint Oreo ice cream truly redeemed my first epic failure and allowed to me enjoy mint chocolate again. It’s delicious because of the flavors, and more importantly because it was a great way to celebrate TGR’s second anniversary. Here’s to many more…”until 120″ as they say! This was so delicious, that I ended up eating entirely too much of it!!!!! You and me both! I ate the other half!